On Monday, I introduced the Astor House, which was said to have been built in the 1780s. Today, I'll introduce the available evidence regarding the house. 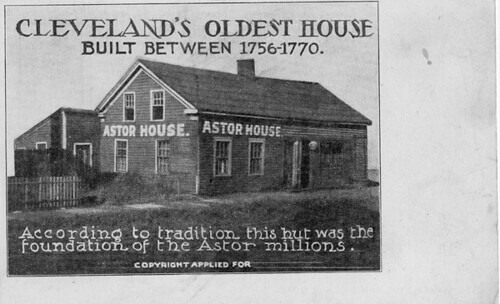 The significance of the Astor House first appears in the public record in 1883, in the Annals of the Early Settlers Association. Virtually all of the later articles on the structure derive their facts from these articles, so I've reproduced them below rather than participate in another attempt to rephrase what is already second or third-hand information. "I bought the house from old Joel Scranton forty-four years ago, and from him I learned its history, and all I shall tell you about it before I owned it, will be on his authority. The Northwestern Fur Company built it possibly two hundred years ago for a fur warehouse. The company consisted of Scotch, British and French, but the first-mentioned had control of it. The house was built up at the head of the old river-bed, or rather where the head now is. After it had been there in use a number of years, the beavers built a dam across the river right about opposite where the rolling mill stands, and the river made another mouth of its own accord from there in to the lake. The company then moved the house from where it was built to a point above the dam, thinking it was better to do that than to disturb the beavers, as it was their skins they were after. It remained there till sixty-three years ago. That was the time the Ohio canal was built. The government decided that year to dredge out a new mouth to the river, and the house was moved over on the government land near where the stone pier now is, on the other side of the river. It was moved before the new channel was dug, so they did not have to take it across the river. Here it stood for quite a number of years, used for the same purpose. After a while it was moved from there up to the corner of Superior street hill to where the Oviatt building now stands. Ward & Blair owned the property there and an adjoining warehouse, and I don't know whether they bought or rented it. This was right opposite the Cathan corners, which were where Myers, Osborne & Co.'s works now stand. These corners were well known all over the Western Reserve, and between these corners and Superior street hill was the only place of crossing the river, and that was by ferry. I bought the house from old Joel Scranton forty-four years ago. When I found it was such an old house and had a history, I decided to preserve it, so I took it apart, and moving it in sections, set it up where it now stands. There were eleven courses of shingles on the roof, one on top of the other; the under shingles were the long ones, which looked more like barrel staves, while those on top were more modern and smaller. I used it as it was for six years as a joiner shop, then I took the old siding off and put on new, as it was quite an eyesore to the community in its original shape. There was no saw mill farther west than Albany when it was built (so Scranton said), and every stick in the house, even to the siding and long shingles, was hewn out with a broad ax. The house was made entirely of chestnut, as that wood is easily hewn, and when I found that out, I replaced every piece that I had found unsound, with chestnut. The shingles and siding are about all that there is of the house as it now stands that was not in the original warehouse. When I took it down to move it, I found it full of hairs from the bottom to top and between the floor of the upper story and the ceiling of the lower was entirely filled up with hair. The houses seemed full of it, and there is hair in it at the present time. According to Scranton its age can be traced back one hundred and forty years. I think Scranton's ancestors were connected in some way with the old fur company. Scranton was a queer old man; never talked much - about once a week on average. When I was taking down the old building, he would come and stand there with his arms behind his back under his coat-tails, and look at the old building in a longing way. One day he came there as usual, and after a while he said, "Well, well, many is the pound of tea I have sold in that old building to the Indians for $10 per pound, and taken my pain in skins." It seemed a sorry time to him that such a day was passed. You see, he got the skins for about two shillings a piece, or thereabouts, so he made a pretty good thing of it. He told me that there was one older house in Ohio than this one, and that was in Marietta. I don't know whether that is standing or not, but think likely that it is. I suppose we ought to give in to Marietta, and we take the next to the oldest. It has been used as a dwelling house for thirty-eight years. After I had used it for six years as a joiner shop, I used it myself as a dwelling for ten years, and it has been used as such ever since. From another source it is learned that John Jacob Astor bought and sold merchandise in this old warehouse when it stood on the flats." In the "Annals of the Early Settlers Association of County," published in 1883, is an account of an old house at the corner of Hanover and Vermont streets in Cleveland, (West Side,) said to be about two hundred years old. That a house that age exists within the borders of the Western Reserve will news to most of its citizens. Mr Robert Sanderson is its present owner. Many may have doubts of its antiquity. We have some evidence - not exactly corroborative - regarding an old house which once stood near the site of this: Colonel James Hillman, Youngstown's earliest settler, in a letter written in 1843 (found on page 353 of Colonel Whittlesey's Early history of Cleveland), relates a journey as pack-horse man, in 1796, from Pittsburgh to the mouth of Cuyahoga river with goods, to be taken thence to Detroit by water. 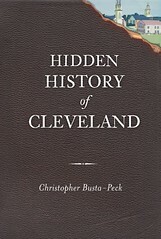 He says that near the mouth of Tinker's Creek "we crossed the Cuyahoga and went down the west side to the mouth. In going down we passed a small log trading house, where one Meginnis traded with the Indians. He left the house in the Spring before we were there." He adds, that on a subsequent trip that Summer he, and those with him drew, small logs and built a hut at a spring near where Main street comes to the river, "which I believe was the first house built on the Cleveland side." He speaks of the Meginnis house as a "small log house." 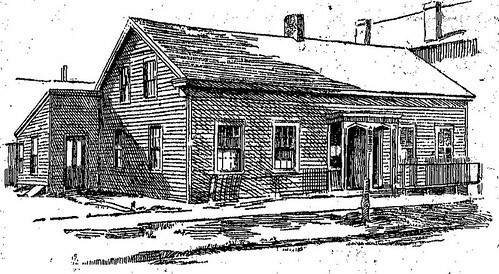 The "old house" described by Mr. Sanderson was a two-story house with chestnut siding - a very different house. If it had been at or near the mouth of the river Mr. Hillman would probably have seen it and mentioned it in his letter. And yet it may have been built where stated by Mr. Sanderson and have been one of the age named If it was about two hundred years old, it was erected, say in 1683. If one hundred and forty years old, in 1743. More than two hundred years ago the French possessed Canada, which they called "New France." They were pushing their settlements and trading posts westward along the great lakes and rivers. In 1683 they founded Detroit, and had probably at that time visited the mouth of the Cuyahoga. About 1753 they had erected Fort Duquesne, at the confluence of the Allegheny and Monongahela, near Pittsburgh. It is not improbable that they may have had trading posts on the south shore of Lake Erie, and perhaps the "old house" was one of them. John M. Edwards, Youngstown, O.
Annals of the Early Settlers Association, Number 5 (1884), pages 84-85. How much of this can we be sure of? Was the house really as old as has been suggested? What can we say that we actually know about this house? I'll answer these questions and more on Friday. Said to be the oldest house in Cleveland and to have been used by Astor's Fur Company before Cleveland was surveyed. There is great doubt as to this. Alfred Kelley locates a Trading House on the west side, on his map of 1814, giving date of house as 1786. This may be the house here shown. The house was built of hewn timbers, later covered with sidings. Joel Scranton owned it for a number of years and sold it to Robert Sanderson in 1844. It was moved to Frankfort street from its original location on the flats near the river. By 1920, in an effort to preserve it, the house was moved to Edgewater Park. 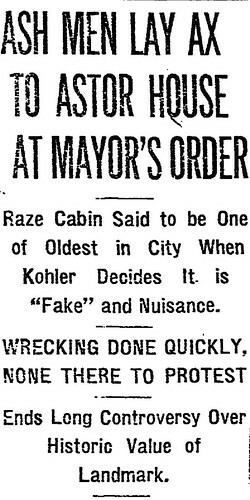 However, on October 14, 1922, on the orders of mayor Fred Kohler, it was demolished. A large gang of city ash wagon drivers yesterday laid irreverent hands upon the old Astor house, the city's most venerable landmark, reduced it to small pieces, loaded the pieces into city trucks and carted them off to the municipal dump. The work started at 10 a.m., and at 3 p.m. only a barren spot on park land just off Bulkey boulevard N.W., near the American Shipbuilding Co. plant, remained to mark the spot where the house had stood. The ash wagon drivers acted under direction of J.W. Morris, deputy street commissioner, who, in turn, said he got his orders from Mayor Fred Kohler. "I don't know much about it," said Mr. Morris, "except that the mayor came into my office this morning and said, 'Go out and tear down that old fake.' I'm doing it." Morris said he considered the house, supposed to have been built in 1787, decidedly unsafe. School children have made pilgrimages to the house and he feared the building would collapse on them. The mayor shared that view, he said. The ash shovelers worked manfully, yanking off the tar paper roof in great chunks and tearing out the walls with the aid of a motor truck and a log chain. Nobody appeared on the scene to voice even the slightest protest. Every indication was that the mayor had stolen a march on his enemies, striking quickly and without advertising his intentions. Members of the patriotic societies and others who have tried repeatedly to induce the city to maintain the old house for its historic interest and assocations knew nothing of the mayor's action, and today they'll have to look for their treasured heirloom on the lake front dump. While the last remnants of the house were being carted away, the mayor was enjoying himself at the Maple Heights races. Stanley L. McMichael, when secretary of the Cleveland Real Estate Board, induced John T. Feighan, vice president of the Cleveland Trust Co. and the last owner of the house, to turn it over to the city. Mr. McMichael said he had been assured by city officials at that time that the building would be put into repair and maintained, possibly as a historical museum. No action was taken by the city, however, and a week ago, in a sarcastic leter to Park Director G. A. Ruetenik, Mr. McMichael suggested that the house be burned in official ceremonies while the police band played the dead march from Saul to signalize the death of the city's civic pride. The mayor countered with the suggestion that McMichael cart the house up on Prospect avenue and live in it or use it as a real estate office. "The old shack is a fake, anyway," the mayor said. "The Astor house was a log cabin, history says, while there isn't a log in the whole of this shack. Besides, who gives a hoot for the Astor family, anyway? They don't live here." No logs were found in the house when it was torn down yesterday. The upright supports were of very heavy timber, perhaps six inches wide by four inches thick and morticed together at the edges, but there were no logs. Mr. Morris also was sure yesterday that as a historic relic the house was a fake. "I've lived here forty years, with the exception of a few spent in Chicago," he said, "and I never heard of this ruin until just recently. If it were genuine it seems to me that something would have been said about it before this." The men and women who tore down the house were born in Italy, Austria, Poland, and various other places, with a sprinkling of native born, and none of them knew who John Jacob Astor was and what's more, most of them said they didn't give a darn who he was. They did know they had signed as ash shovelers and that house wrecking wasn't in the contract. Some grumbled at the job, but not for sentimental reasons. The house is supposed to have been built fully seven years before Moses Cleaveland came to the Western Reserve and founded the city that bears his name. It was located near the old mouth of the Cuyahoga river at the foot of what is now W. 58th Street. It was said to have been a fur trading post for John Jacob Astor, who built up what at one time was considered the greatest fortune in America. Later the house was moved to Whiskey Island. When the government opened the present outlet of the river the officers in charge moved the house to the new pier. Then it was toted to the foot of Superior avenue. It has been moved many times since then, each time receiving patches and additions. Whether the structure torn down yesterday bore any resemblance to the original Astor house is a debatable question, but it is certain that it was one of the oldest houses in the city, if not the oldest. Generations of Clevelanders have lived and loved and died in it. But it had become a natural target for vandals. The plaster had fallen away, even laths were missing in spots and the windows had long been boarded up. Was this house really built in the 1780s, or perhaps even earlier? 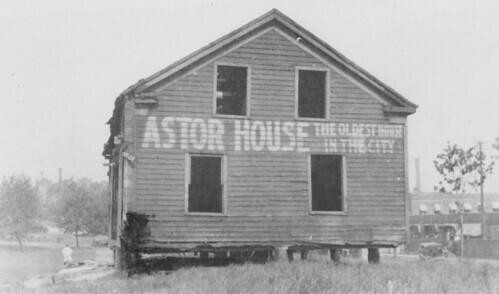 On Wednesday, I'll offer an in-depth look at the history of the Astor House.